The delays seemed to be easing late Friday morning. The F.A.A. said it was slowing traffic in and out of the airports because of staffing problems at two of its air-traffic control facilities on the East Coast, one near Washington and one in Jacksonville, Fla. Those facilities manage air traffic at high altitudes. The agency said there had been a slight increase in the number of controllers calling in sick at those facilities on Friday morning. The control towers at the airports that serve New York City and the central air-traffic control facility on Long Island that monitors those airports were fully staffed, said a person who had been briefed on the situation. In Washington, Democratic leaders pounced on President Trump, blaming him for the air traffic slowdown. Representative Steny H. Hoyer of Maryland, the No. 2 House Democrat, echoed the speaker — and also sought to assign blame to Senator Mitch McConnell, the Republican leader. Mayor Bill de Blasio learned about the issues at La Guardia Airport during a radio interview Friday as he attended the United States Conference of Mayors in Washington. The union that represents flight attendants on Friday said they had been warning that the lengthy government shutdown would start harming the nation’s air travel system. 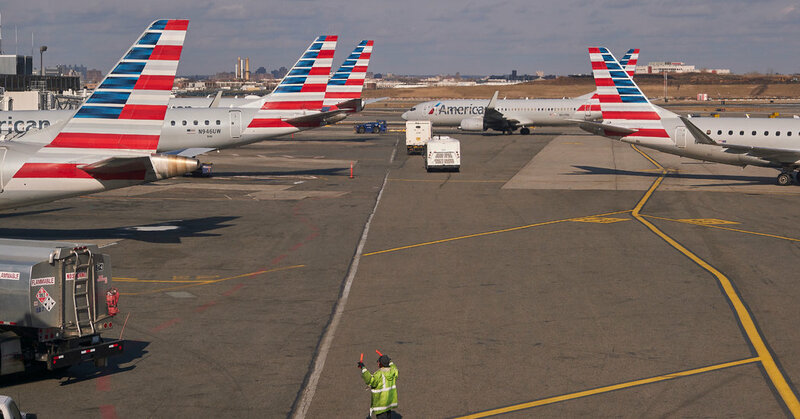 A spokesman for the Federal Aviation Administration confirmed that it was rerouting planes and slowing air traffic to cope with an increase in the number of controllers calling in sick. On Friday morning, the departures screen at one of the terminals at La Guardia Airport in New York began to show ‘Delayed’ across arriving flights.